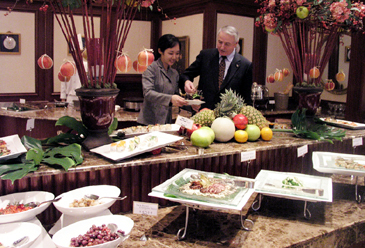 "Cafe" in the Imperial Palace Hotel (former Amiga) offers "Champagne & Wine with Healthy Buffet from" from 6 p.m. to 10 p.m. Monday through Saturday, where customers can enjoy healthy buffet, top-class wine, champagne, and draft beer without restriction, together with detailed explanation of wines. "Champagne & Wine with Healthy Buffet" is prepared for salary men who are mentally and physically tired of daily works, and it is available from 6 p.m. to 10 p.m. on Monday through Saturday. All the tables are gracefully decorated with candles and the whole lighting feels soft so customers can enjoy dinner, together with wine, under a cozy atmosphere late evening. The staffs of the Cafe tell a story of a wine to each table and refill wine glasses without restriction as far as customers want. Four luxurious wines from France and Chile, two champagnes and draft beer are served without restriction, and the healthy buffet consists of about 40 kinds of dishes such as Neobiani (seasoned beef in width), cold noodles with raw skate on it, fried rice noodles, appetizers made of top-class marine products which are suitable for wine, cheese collection, etc. It is available at ￦43,000 (plus tax and service charge).